London, Jan 24 (ANI): Experts want to redefine the kilogram, which came into existence two centuries ago. They fear it is not as constant as it should be. Experts are willing to make the changes so that it is no longer based on the mass of a solid cylinder of platinum-iridium alloy that sits beneath three layers of protective glass sealed in a locked vault in Sevres, France. This metal block, known as the International Prototype Kilogram, has been used since it was first registered with the International Bureau of Weights and Measures (BIPM) in 1889 as the definitive unit of mass against which all other kilograms are measured. In the past 122 years, it has been brought out of storage just three times to calibrate the national prototype kilograms used by countries around the world. 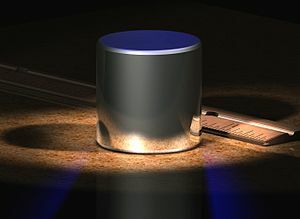 However, scientists now believe it is time to redefine the kilogram because there is evidence that the precise mass of the international prototype in Sevres is not as constant as it should be. “We think it is losing weight, and we don’t know why,” the Independent quoted BIPM’s Michael Stock, as saying. “From the three times we have had it out to make calibrations, we have had indications that it is not perfectly stable. It seems to have lost about 50 micrograms and there is no real explanation,” he said. “There are no real problems now but if it continues, then we may run into problems in 10 or 20 years’ time because measurements are getting even more precise. This entry was posted on January 25, 2011 at 3:35 PM	and is filed under Anomalic Interferences. Tagged: International Bureau of Weights and Measures, Kilogram, London, Measurement, Planck constant, Royal Society, Sèvres, The Independent. You can follow any responses to this entry through the RSS 2.0 feed. Both comments and pings are currently closed.